What we are looking at today is a visual conflation of modern-era technologies–we are looking at a train on film. As Holly and Anna wait in this deserted station cafe (you can see the edge of a poster in the upper left), we watch Anna’s train depart without her on it. But for this post, we will depart from our usual incursion into story, and focus instead on the marvelous image we are presented with. I know it may not seem like much, but bear with me. Today we see a train window, illuminated and ghostly in the residual steam and smoke of the engine, as it flashes by our view, a window glowing within a window. What this still fails to capture, is the motion. Conveying to our story that 0h-well shrug of the missed opportunity, these series of glowing squares, the windows of the train, flutter by with increasing velocity as the train picks up speed. So, our resulting image is a frame, alternately filled with squares of light or darkness, eerily reminiscent of the filmic image itself. The film projector, of course, projects similar alternations, squares of light followed by darkness, which through their strobing alternation create the elusive illusion of motion, the living element of the film itself. Lacking only a shutter, which would allow these train window “frames” to enter or vision and leave it under cover of darkness, this image is the structure of the film projector. And looking at these cousins, it becomes apparent that their connection is more than coincidence. Even on a technological (or to continue to humanize them, physiological) level, there is an aesthetic connection between the two systems. 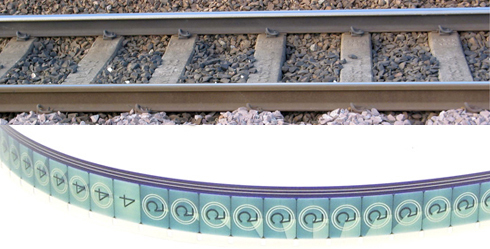 A train track observed from above looks an awful lot like a film strip, and the wheels and engines, are not dissimilar to the internal workings of a projector. Viewed from above, train tracks and filmstrips follow an essentially identical structure, with railroad ties dividing the ground into comprehensible frames and the rails standing in for sprockets and sound tracks. Brand harnesses the illusion of motion that can be created by this system of transit that puts us in front of a window screen watching things whiz by. We, on the train, become the film flitting through the projector, essentially watching the strobed images of passing faces as if they were a film themselves. But, just like Einstein’s twin paradox, the difference between the non-moving and moving perspective is specially relative, and both observers may see the same illusion of motion. Backing up a bit to the development of today’s cousins, cinema and railroads, there is no doubt that both technologies changed the world, engaging in what Marx so quotably called “the annihilation of space by time,” but it is also clear that railroads changed the world first. The railroad, particularly in countries as vast as the United States, allowed a massive unification to take place. Essentially, it is with railroads that “the West was won,” whether it was using trains to massacre thousands of buffalo (as a sort of scorched earth policy against the native Americans who relied on them for food), carry messages and goods from the city to the frontier, or connect the disparate coasts of the U.S., trains played an essential part in the development of this country. And the sordid history of the railroad empire is directly connected to the roots of cinema. In May of 1869, at a ceremony in Promontory, Utah, Leland Stanford drove in the “golden spike” connecting the Central Pacific and Union Pacific Railroads. This event was perhaps the first “mass media” event, with telegraphs connected to the actual spike so that the railroad’s ceremonial completion would literally send a click to telegraph operators the moment it happened. (This telegraph hookup failed, though, so the word “DONE” was sent out coast-to-coast moments after the spike was driven in.) But, three years after this event, Stanford commissioned British photographer Eadward Muybridge to settle a bet. Stanford wanted to know whether, while galloping, a horse’s four feet ever left the ground. The resulting pictures, taken in fast succession, demonstrated a scientific breakthrough in the study of motion, and later inspired Muybridge to invent one of the first primitive film projectors, the Zoopraxiscope. Muybridge’s horse photos were later animated to create this image. The photographs achieved two essential goals. They won Leland Stanford’s bet, and they started the invention of cinema. The rest, as they say, is history. Inspired by Muybridge’s photographic experiments, many innovators designed their own moving image devices, but in the end, something about the magical shared experience of the theater won out, and the Lumiere brothers’ cinematographe (a combination camera, developer, and projector) broke new ground in what would eventually become today’s movie-theater experience, spawned at least partially, from Leland Stanford’s work with railroads. But that is only half of the story. Today’s Still Dots, which sparked this wild line of exploration is indeed a visual representation of the technical and developmental similarities between cinema and railroads, those cousins, but it is also an image of a train. And the history of film is littered with images of similar trains. Back to the beginning, we can look again at the work of Auguste and Louis Lumiere, whose story is one of those essential cinematic creation myths. 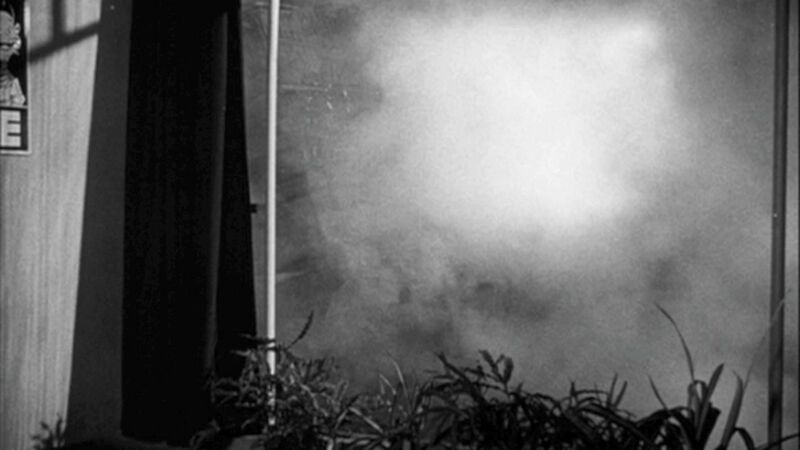 When the Lumiere brothers first screened L’Arrivée d’un Train Ã la Ciotat (Arrival of a Train at La Ciotat) in 1895, the audience was supposedly driven into a panic at the realism of a train headed straight for them. Whether or not this myth is true or, as some scholars and historians now claim, a sort of “viral marketing” stunt to promote the glory of the cinematic image, what matters is trains’ inclusion in these earliest films. Sixteen years later, D.W. Griffith would again break cinematic ground with a train. The Lonedale Operator (1911) introduced cross-cutting, the basis of the classical Hollywood system for narrative filmmaking, and the close-up to Hollywood. Matt has already discussed this legendary close-up, but it all revolves around the train. The operator himself is the hero coming to the rescue and in this early masterpiece, it is only the train that can save the day. And all of that is not to mention the generations of parodies to come from Griffith’s classic train narratives. The steam engine has almost become a stand-in for early cinema. Another example of early filmmaking brilliance and the train is Edwin Porter’s The Great Train Robbery (1903). 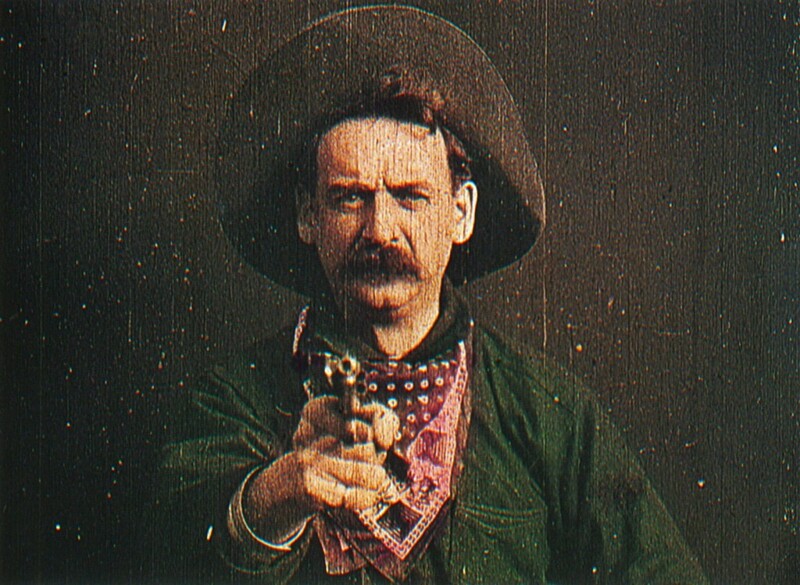 This medium close-up was hand tinted to increase the terrifying realism as the bandit turns his gun on the audience. Of course, the train’s importance in cinema did not die out with the cinema of attractions. Think of Alfred Hitchcock’s train-centered pictures, from North by Northwest, to Strangers on a Train or even Marnie. In the world of less arty films, how about that terrific train-based fight scene in From Russia With Love or Indy’s train chase in Indiana Jones and the Last Crusade? Or how about the train scene in Dogma? Whatever the example, it’s clear that cinema’s love affair with trains has not ended yet. If you want to sell your service, I’m not willing to be the price… I loved him. You loved him. What good have we done him. Look at yourself, they have names for faces like that. And as she should, with aplomb, she walks out and drops Holly’s overcoat on the floor behind her, condemning him and—as far as the story is concerned bringing us ever closer to The Third Man‘s final climax.